Newman’s metaphor for acts of the will is that of a journey—at each point along the way, there is a limited kind of knowledge that is made complete at the destination. There is a territory that must be trod, which cannot be hurried or isolated from the larger trek, and on which one must tread cautiously, constantly discerning the way and the goal. This is, of course, the perpetual journey of all men who are called to communion with Christ. But I became more and more aware of Rome as my destination around 2011, when I met Newman through his poetry.He proved a reliable travel companion. I was raised an evangelical Protestant, and was taught by my loving family to love Christ, love others, be devoted to Scripture, and to study theology. I also developed a keen love for poetry, especially that of T.S. Eliot, Dante, Hopkins, John Donne, George Herbert, and John Milton. I slowly discovered that all of my favorite poets were either Catholic or Anglicans (ignoring Milton’s sectarianism). While attending a Protestant Bible college, and studying poetry, I came across Newman’s Dream of Gerontius. Looking back, I can see that this first pricked my heart in a Catholic direction. I was moved and inspired by what I did not know at the time were depictions of Catholic dogma: the intercession of saints, Last Rites and Extreme Unction, purgatory, man’s cooperation with Christ’s grace for salvation, penance, and on and on. I was particularly struck by the structure of heaven, which the soul of Gerontius passes through on his way to God after his death: it was a palace made up of choirs of angels. The very architecture of heaven was praise, and the end and goal was an individual soul’s union with God, his marriage to God. I had never felt so moved by the idea that each soul is destined to eternal communion with the Father in such a real way. Over the course of the next five years, as my heart and mind were stirred by Catholic teaching, Catholic friends, and Catholic churches, I felt the need to, as Newman did, bring my will into alignment with my emotions and my intellect—to act. My wife and I were Anglican for three years, during which time I was encouraged to study for Anglican Holy Orders (the Anglican Church permits non-celibate clergy). While in seminary, I saw Newman’s name on a bookstall, and remembered how moved I had been by his poem in college. I had also heard his name in connection with his (? )Anglican conversion to Catholicism, which I knew deep down would be my path as well some day. I picked up the book, and found myself reading An Essay on the Development of Christian Doctrine, which depicts all aspects of the Catholic Church and her teachings as containing their seed and vital growth from Christ, to the Apostles, through the Church Fathers and Medieval doctors, and to the present day. With Newman, I saw clearly that the Catholic Church is indeed the same Church that Jesus Christ instituted over 2,000 years ago, and that I, as an Anglican, was a part of a schismatic sect that, while retaining much of the grace of God mediated to us by the Scriptures, the commandments, ecclesial forms and worship, ultimately owed these things to the Catholic Church made manifest under the See of St. Peter. Reading Newman was like watching dominos fall toward Rome—the further I read, the less and less I could help not being Catholic. I read the Grammar of Assent, which helped explain my own experience of assenting to Catholic dogma; I read his novels, poems, and sermons, which warmed my heart to Catholic truths, as well as the person of Blessed John Henry Newman. I read the Idea of a University, which showed me the Catholic roots of the university and education, as well as the fundamental primacy of theology behind all academic and epistemological enterprise. And, of course, I read the Apologia Pro Vita Sua, which deepened my love for Newman and gratitude for all the graces held out by God through the Catholic Church. By my second reading of Newman’s Apologia, I realized that I could no longer in good conscience take vows to Anglican holy orders, and that I had to convert to Catholicism. Glory be to God, around this same time my wife was ready to convert with me, but that is a different story. Newman’s insight illustrates the practicality of the communion of the saints, and to the Divine end toward which Christians strive. Holy people buoy us up and goad us on, and the three Holy Persons of the Blessed Trinity is our goal. The grace God offers us is the gift of his very Self, his very Person; or, as Newman puts it in his hymn “Praise to the Holiest:” “God’s Presence and his very Self / And Essence all divine.” Saintly friendships incline us to this grace because, in a blessed host of saints and angels, the love of God that is “poured into our hearts through the holiest Spirit” (cf. Rom. 5:5) is the common bond that unites those friendships. 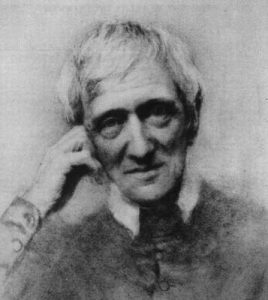 John Henry Newman was a gift to me in his own self, and because he introduced me to other holy persons, to a whole new landscape of possibilities in my journey toward life everlasting. G.K. Chesterton, “Why I Am a Catholic,” in G.K. Chesterton: Collected Works, Vol. III (San Francisco: Ignatius, 1990), 125. John Henry Newman, Apologia Pro Vita Sua (New York: Penguin, 1994), 158-9. Newman, “Secular Knowledge Not a Principle of Action,” The Tamworth Reading Room in Discussions and Arguments (Pittsburgh, PA: Newman Reader, The National Institute for Newman Studies, 2007), www.newmanreader.org/works/arguments/tamworth/section6.html. Robert’s story highlights the role of friendship with the saints, a friendship that draws us closer to Christ and to his Church. Blessed Newman had many friends and teaches us a lot about friendship. Robert, thank you very much for your conversion story. The insights on how Bl. Cardinal Newman’s friendship has helped you on your way to Rome are beautiful. Is amazing to think how the Saints in Heaven are looking up for us.